PennDOT is deep into its preparation for the winter season already (yes, in October), which means we're hiring equipment operators, stocking up on road salt, and making sure our plows are ready for action. But did you know snow removal wasn't always a given on Pennsylvania roads? 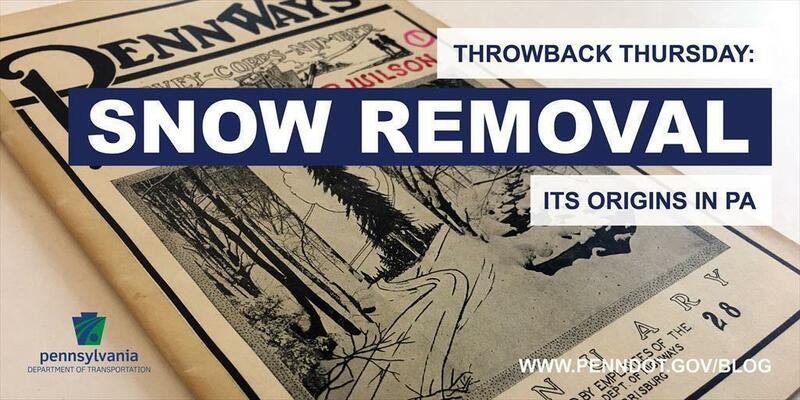 The department recently uncovered an article from the January 1928 edition of PennWays, a publication of the employees of the Pennsylvania Department of Highways that reveals how snow removal began in the state. And, as with most things, it came down to business and money. The federal government needed to move goods during the winter, but the railroads were "taxed to their capacity." This was during the winter of 1917-18 — we were at war and desperately needed to get raw materials, troops, and ammunition to the seaboard. So, "the War Department asked the Department of Highways to guarantee the opening of the Lincoln Highway across Pennsylvania during the winter. This was the beginning of the snow removal program in this Commonwealth, about 300 miles." "During the winter of 1917-1918, the United States Government desired to bring overland from the point of manufacture in Ohio and Michigan, several hundred trucks. The railroads, already taxed to their capacity in transporting raw materials, troops and ammunition to the seaboard for shipment overseas, felt that it would considerably reduce their tonnage by bringing the trucks overland to the point of shipment. "The principal obstacle to winter traffic, especially over the Allegheny Mountains, was snow which varied from 24 to 129 inches annually. The War Department asked the Department of Highways to guarantee the opening of the Lincoln Highway across Pennsylvania during the winter. This was the beginning of the snow removal program in this Commonwealth, about 300 miles. It has been gradually increased until in the winter of 1926-1927 the Department kept open a little less than 8,000 miles with several hundred tractors and 1,160,273 feet of snow fence for the prevention of drifts. "Pennsylvania was the pioneer state in snow removal, creating an example which has been taken up by other states with the result that in the winter of 1925-1926, which is the latest information available, there was reported to the Bureau of Public Roads a total of 93,000 miles of highway kept clear of snow. The annual expenditure of this purpose was a little less than $3,800,000 report from thirty-six states in the snow belt. Over 16,000,000 motor vehicles were registered in these states, representing clear roads all year to 66 per cent [sic] of all the motor vehicles registered in the world. "By keeping the snow off the roads and giving all-winter usage to motor traffic the investment in the road surface and the tremendous investment in motor vehicles is not lying idle during the winter months but is bringing a return. "Pennsylvania can well be proud of the progress made during the past ten years in snow removal work, and the field organization is responsible for the comments that the roads in Pennsylvania are invariably open for traffic twenty-four hours a day for 365 days a year. "With the purchase of additional equipment and snow fence, we feel better equipped to combat the elements this winter than ever before."